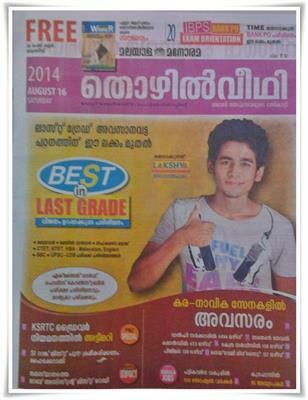 Malayala Manorama Thozhilveedhi 16th August 2014 issue (11th August - Today) is now in stands. To read the latest issue of Malayala Manorama Thozhilveedhi dated 16 August 2014, buy a copy from your local book vendor. Thozhilveedhi from M M Group is one of the leading employment weekly which features updated news on arising opportunities in public and private sectors. Malayala Manorama Thozhilveedhi, one of the leading employment newspaper in Kerala has published its 16th August 2014 edition. The current issue of 'Thozhilveedhi' is thickly packed with new opportunities for the job seekers. The highlights of this issue are the rising vacancies in Army, Navy, Delhi Government, Southern Naval Command, Union Service, PGIMER, Neyveli Lignite, Scheduled Tribe and KUFOS. Solved paper of Kerala PSC LD Clerk held on 6th August has been published in the 16th August 2014 edition. Crash coaching for Last Grade, SSC, SBI, Cooperative Service Society, UPSC CDS, K –TET, C-TET, K-TET, HSA – Malayalam and English are featured in the current edition. While going through the pages, vacancies in Army – Navy, 3394 opening in Delhi government, 403 in Sothern Naval Command, 108 in Union Service, 139 jobs in PGIMER, 157 opportunities in Neyveli Lignite, 100 social workers in Scheduled Tribe, 55 lecturers in KUFOS (Kerala University of Fisheries and Ocean Studies) are also reported. Special coaching for upcoming Last Grade, SSC, SBI, IBPS Bank PO, Cooperative Service Society, UPSC CDS, K –TET, C-TET, K-TET, HSA – Malayalam and English will help the candidates who are preparing for the upcoming exams. Special coaching for Excise Guard and Police Constable exams have found place in the 16th August edition. Like the previous issues, 'Thozhilveedhi' has given special focus is given to GK in the newspaper and also in the free booklet. As General Knowledge is given prominence in all the exams conducted by the Kerala PSC, the booklet will guide the candidates to get the updated information. The application process for various jobs provided in the newspaper will guidance the readers to fill the forms without much confusion. More being an employment newspaper, 'Thozhilveedhi' is a companion of many youngsters who have high interest in building up their career. 'Thozhilveedhi' has already established as an effectual platform for job vacancies and career groundwork. With a circulation of more than 1 lakh prints, this weekly employment newspaper is widely read by job seekers and young people in Kerala. So grab 16th August 2014 issue of 'Thozhilveedhi' from your nearest book vendor and make your dream come true.